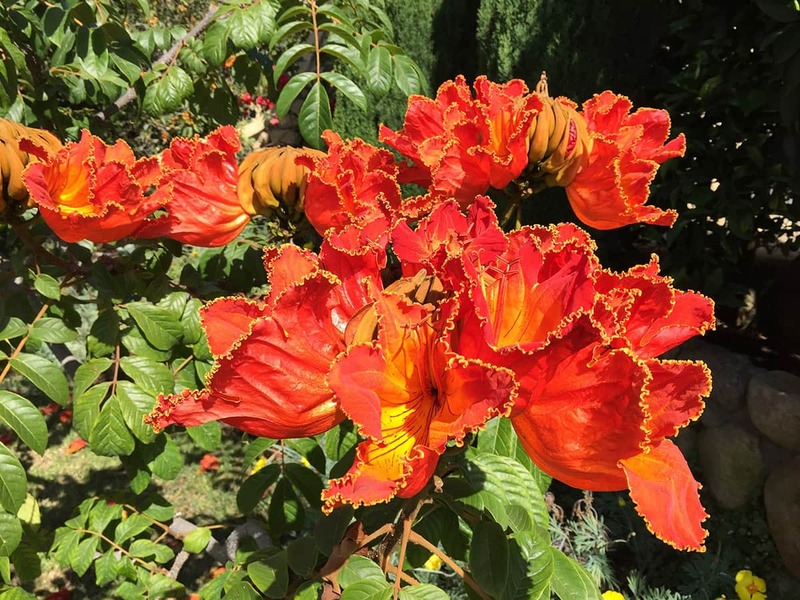 Considered by many to be the most beautiful flowering tree in the world, the African Tulip Tree (Spathodea campanulata) is putting on its best show of glorious flowers right now in Santa Barbara. Its dazzling orange or yellow 4-inch wide bell-or tulip-shaped flowers appear in clusters at the ends of its branches. The orange flowers are sometimes fringed in yellow, making them appear almost fluorescent against the shiny dark green foliage. While they are normally deciduous and bloom from August through October, in warmer, protected locations, the trees can be evergreen and bloom from July through November or longer. In our climate, it is a small- to medium-sized tree, 25 to 30 feet in height. As its name implies, the tree is from west Africa. Its tropical origin makes it susceptible to damage from frost or temperatures below 28 degrees. In colder winters, the tree can experience freezing back to hard wood, with a rapid recovery in the next growing season. They grow best in deep, well-drained soil, but they seem to survive in a wide variety of soil conditions and microclimates from the Lower East Side to the Upper East and Samarkand areas. They do require irrigation when first planted, but the established street trees in town seem to be surviving well on the limited rainfall we’ve had in the drought. 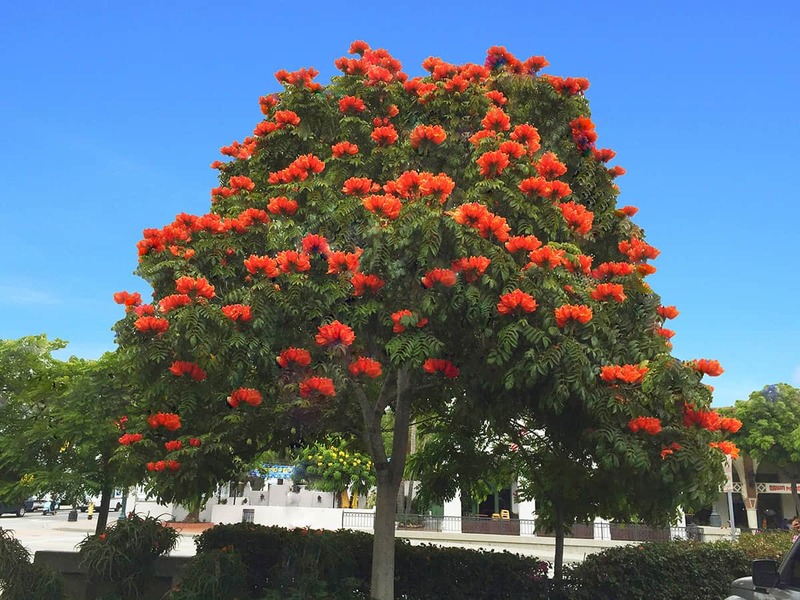 The best places to observe these magnificent trees are on lower Voluntario and Alisos Streets, the first east and west blocks of Quinto Street off State Street, and El Prado Drive. 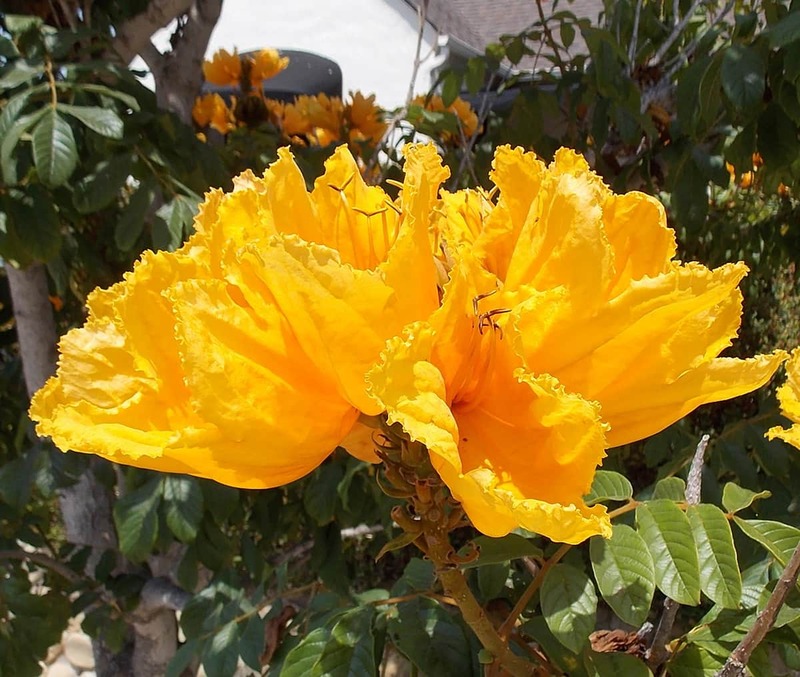 There are examples of the rarer yellow-flowered variety on Quinto Street and El Prado Drive. It is well worth the effort to go and see the trees now, while they are in their full splendor!